The Wah has a habit of buying me incredibly clever birthday presents - ones that I would never think to buy myself, but really love when I open them. This year, it was a Mushroom Growing Kit. 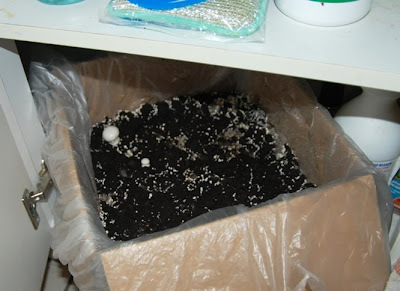 It's a simple, one-box system - you empty a bag of soil and spores onto a layer of mulch/compost, keep it moist and in a dark place, and voila - your own home-grown mushies. Just over three weeks ago, we set up the kit, and placed it under the sink. For two weeks, nothing much happened, except for the appearance of tiny white spots, the size of a pinhead. You can see that a decent sized baby mushroom popped out of the soil, with an even tinier brother next to it. That's right - I am growing the Emperor Funghi under my sink. 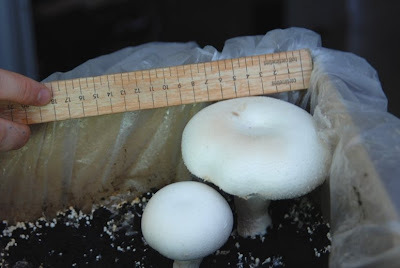 The baby brother mushie has also increased in size, but we don't have any others poking their heads up yet. Hopefully they'll make an appearance in the next week or so. Read the Title and thought, "Beauty. A recipe for Emperor Penguin and Mushrooms." But it was not to be. There doesn't seem to be enough "Gold" colour in them there Mushies Oh Great Clumsy One. the FUNGI from YUGGOTH the dreaded MI-GO. Go now, flee or I shall begin reciting all 35 verses of the H.P.Lovecraft poem about the fungi. Be Careful, GC. Pretty soon he'll be big enough to walk around, and then you're gonna have to put fungus-proof edges and locks on all your kitchen counters. Just beware of the Smurfs though!